Passant obtained her LLB from Faculty of Law English Section in 2007. She joined the firm in 2017 as a Senior Associate. Passant is specialized in providing consultations to our clients with regard to various trademark inquiries, in addition to industrial designs, copyrights and Domain names. 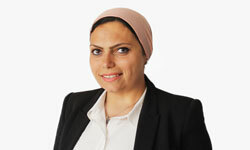 She handles disputes, legal actions related to trademarks contact with clients regarding IPR infringements by third parties and possible remedies. She assists in all matters related to change of ownership, and transfer. She deals with registering national and international trademarks, dealing with refusals and filing appeals/oppositions and counter-statements. Passant is a member of the Egyptian Bar Association and the Arab Society for Intellectual Property (ASIP).